Weed management in container nursery crops can be costly! Some research estimates overall costs, including herbicides, labor for application, and hand weeding, can be over $4000 per acre. 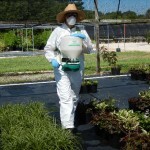 Growers in the Southeastern U.S. utilize multiple (up to 6) applications of PRE herbicides each year, yet labor to hand weed pots continues to be a significant expense. Several strategies have been investigated to try to reduce overall weed control costs. A summary of this information presented at the 2016 Nursery Crop Weed Management Field Days is available in the field day handout. More detailed information is available at the following links. Can’t use herbicides? Mulches can be effective and cost-effective.